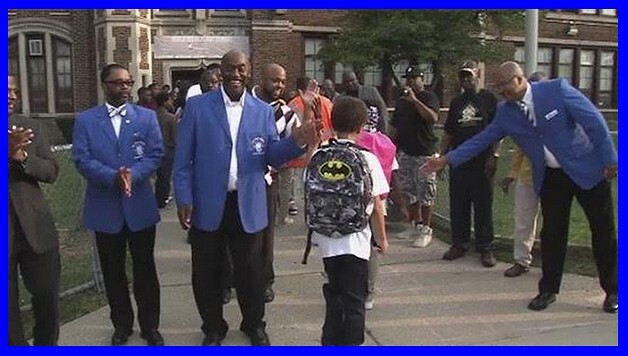 Brothers of the Nu Alpha Sigma chapter of Phi Beta Sigma Fraternity Inc., lined up to greet and encourage students for their first day of school in Detroit this week. This is part of a recent wave done by members of Black Greek fraternities who are stepping up to the plate and showing support to the world’s future leaders by showing up in large groups outside of elementary schools and welcoming children on their first day of school. The brothers dressed in blue and white, lined up outside of the front door of the school and showed the children how much they were cared about and how much the community wants them to do well in school. This display of strong Black men who took time out of their busy schedules to show these children love left a big impact on the community. We would like to encourage you and your chapter to follow in their steps with or new WatchTheYard.com initiative #WTYCareChallenge. Gather with people from your fraternity and sorority wearing letters. Contact the principle and set up a time to show up in front of their school. Line up outside of the entrance of the school and give kids encouragement as they walk into school! Send the pictures/video in to us and we will write a story about your chapter!